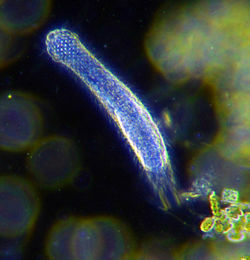 Darkfield photograph of a gastrotrich. Gastrotricha is a phylum of microscopic, free-living, aquatic worms, characterized by bilateral symmetry and an acoelomate body plan. These animals, which are mostly less than 3 millimeters in length, are found in both freshwater and marine ecosystems. They often have very high population densities. In marine sediments, they rank third in abundance and in freshwater ecosystems (as part of periphyton, benthos, and plankton), they rank among the top five most abundant groups (Todaro 2006). There are about 750 species, arranged into two orders, Chaetonotida and Macrodasyida (Todaro 2006). Occurring in large concentrations, gastrotrichs are integral to aquatic food chains, consuming various bacteria, microalgae, and protozoans and being consumed by larger organisms (macrofauna and turbellarians). For most humans, other than adding to the wonder of nature, gastrotricha are not of obvious importance. But for researchers, they play an important role in delineating the origin of pseudocoelomates and other efforts to elucidate the history of life and connectedness of organisms (Wirz et al. 1999). Gastrotrichs (from Greek gaster "stomach" and thrix "hair") are microscopic in size, ranging from 0.06 millimeters to 3 or 4 millimeters in length (Todaro 2006; Ramel 2008). Their body is veriform (worm-like in appearance), with bilaterally symmetry and a complete gut. The body is covered with cilia, especially about the mouth and on the ventral surface. There are terminal projections with "cement" glands that serve in adhesion, allowing them to temporarily adhere to submerged surfaces, such as vegetation. This is a double-gland system where one gland secretes the glue and another secretes a de-adhesive to sever the connection. They do not have a circulatory system, but do have a nervous system with ganglia (Ramel 2008). Gastrotrichs are acoelomate—that is, they have no true coelom (body cavity). Originally they were thought to have a body cavity (pseudocoel), but this was an artifact created by preservation methods, and they are now known to be acoelomate. Gastrotrichs demonstrate eutely, with a fixed number of cell (biology) cells within a species. That is, development proceeds to a particular number of cells, and further growth comes only from an increase in cell size. All species of Gastrotricha live in aquatic environments, both freshwater and saline ecosystems. Most fresh water species are part of the periphyton (mixture of algae, cyanobacteria, heterotrophic microbes, and detritus that is attached to submerged surfaces) and benthos (organisms which live on or in the bottom of water bodies), with presence to a lesser extent in the plankton (organisms that drift in bodies of water) (Todaro 2006). Marine species are found mostly interstitially in between sediment particles. There can be very high concentrations of gastrotrichs in aquatic ecosystems. In freshwater, the population density may attain 158 individuals per ten square centimeters, ranking this taxon among the five most abundant taxa (Todaro 2006). In marine sediments, the density of gastrotrichs may reach 364 individuals per ten square centimeters, placing them third in abundance after the nematodes (Nematoda) and the harpacticoid copepods (Harpacticoida) (Todaro 2006). Gastrotrichs are free-living organisms. Like many microscopic animals, their locomotion is primarily powered by hydrostatics. Gastrotrichs feed on diverse living and dead organisms, including microalgae, bacteria, and small protozoans (Ramel 2008; Todaro 2006). They swallow there food in the manner of free-living nematodes, utilizing a muscular pharynx to create a powerful sucking action (Todaro 2006). They themselves are prey for small macrofauna and turbellarians (Todaro 2006). Members of Gastrotricha are either parthenogenetic or hermaphroditic (Ramel 2008). Freshwater species appear to be nearly all parthenogenetic (meaning all females). They produce both a tough, overwintering egg that needs to experience such conditions as drought or excessive heat or excessive cold in order to hatch (Ramel 2008). A second egg type will hatch almost immediately (Ramel 2008). Marine species tend to be hermaphroditic, possessing male and female gonads, with only one set functional at a time (meaning that each individual is either functionally male or functionally female) (Ramel 2008). A functional male gastrotrich transfers sperm to a functionally female gastrotrich via a spermatophore (Ramel 2008). The young hatch out and soon reach sexual maturity, in perhaps as little as two days (Ramel 2008). There is no larval stage (Ramel 2008). The average life span of a gastrotrich is very short, about 3 to 21 days (Ramel 2008). About 750 species of gastrotrichs have been described. These are arranged into two orders. The order Chaetonotida includes eight families, 30 genera, and about 470 tenpin-shaped species, of which about three-fourths are freshwater species (Todaro 2006). Macrodasyida includes 7 families, 32 genera, and about 280 strap-shaped species (Todaro 2006). The relationship of Gastrotricha to other phyla is unclear. Most researchers suggest, based on morphology, that they are close to the Gnathostomulida, the Rotifera, or the Nematoda (Todaro 2006). On the other hand, genetic studies place them as close relatives of the Platyhelminthes, the Ecdysozoa or the Lophotrochozoa (Todaro 2006). The following classification to the level of genus comes from Todaro (2006). Note that the Integrated Taxonomic Information System recognized 6 families in Macrodasyida in 2006 (ITIS 2006), but that a new family, Xenodasyidae, was designated in 2006 by Todaro, Guidi, Leasi, and Tongiorgi (Todaro 2006). Otherwise, these two systems down to the level of families are identical. Hochberg, R., and M. K. Litvaitis. 2000. Phylogeny of gastrotricha: A morphology-based framework of gastrotrich relationships. Biological Bulletin 198: 299-305. Retrieved June 5, 2008. Hochberg, R., and M. K. Litvaitis. 2001. Macrodasyida (Gastrotricha): A cladistic analysis of morphology. Invertebrate Biology 120: 124-135. Retrieved June 5, 2008. Integrated Taxonomic Information System (ITIS). 2006a. Gastrotricha Metschnikoff, 1865 ITIS Taxonomic Serial No. : 57597. Retrieved June 5, 2008. Integrated Taxonomic Information System (ITIS). 2006b. Chaetonotida Remane, 1924 ITIS Taxonomic Serial No. : 57822. Retrieved June 5, 2008. Integrated Taxonomic Information System (ITIS). 2006c. Macrodasyida Remane, 1924 ITIS Taxonomic Serial No. : 57598. Retrieved June 5, 2008. Manylov, O. G., N. S. Vladychenskaya, I. A. Milyutina, O. S. Kedrova, N. P. Korokhov, G. A. Dvoryanchikov, V. V. Aleshin, and N. B. Petrov. 2004. Analysis of 18S rRNA gene sequences suggests significant molecular differences between Macrodasyida and Chaetonotida (Gastrotricha). Molecular Phylogenetics and Evolution 30(3): 850-854. Ramel, G. 2008. The Phylum Gastrotricha. Earth-Life Web Productions. Retrieved June 5, 2008. Todaro, M. A. 2006. Gastrotricha: Overview]. University of Modena and Reggio Emilia. Retrieved June 5, 2008. Todaro, M. A. 2008. Gastrotricha: Systematics. University of Modena and Reggio Emilia. Retrieved June 5, 2008. Wirz, A., S. Pucciarelli, C. Miceli, P. Tongiorgi, and M. Balsamo. 1999. Novelty in phylogeny of Gastrotricha: Evidence from 18S rRNA gene. Molecular Phylogenetics and Evolution 13:314-318. Retrieved June 5, 2008. This page was last modified on 6 December 2013, at 17:19.